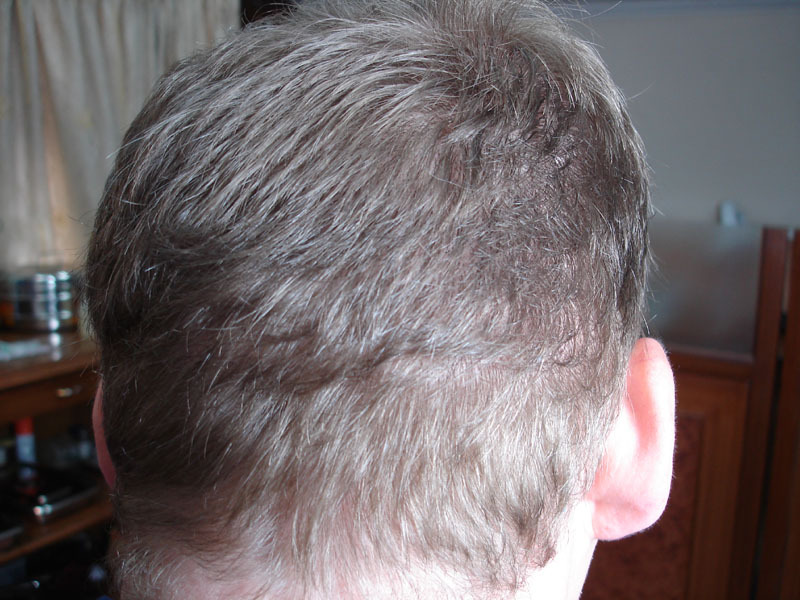 The long time readers may be aware of forum poster hairwar’s case and the repair procedure carried out at our clinic. He recently visited us and was gracious in offering a photoupdate oppurtunity. Pictures below are copied from the above thread. 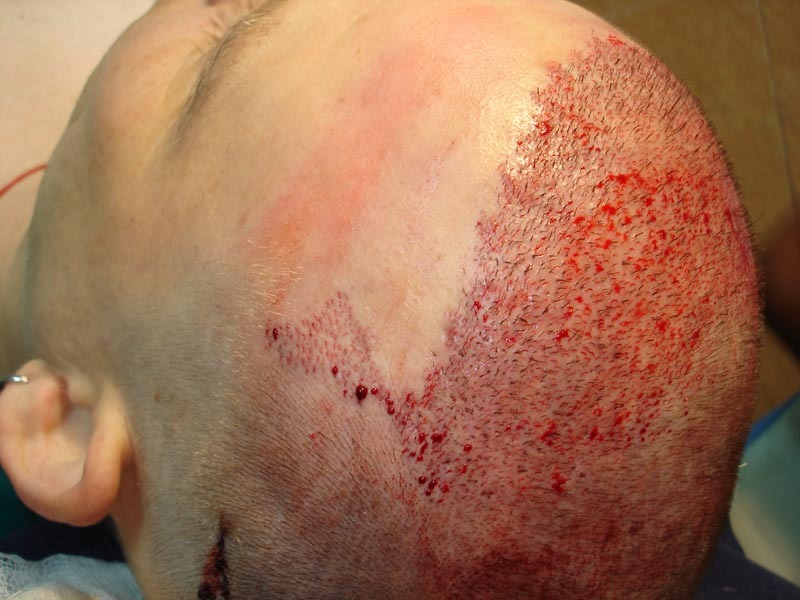 Following is a picture of his scalp donor area. The first issue in front of the doctor and the patient is over the choice of the procedure. 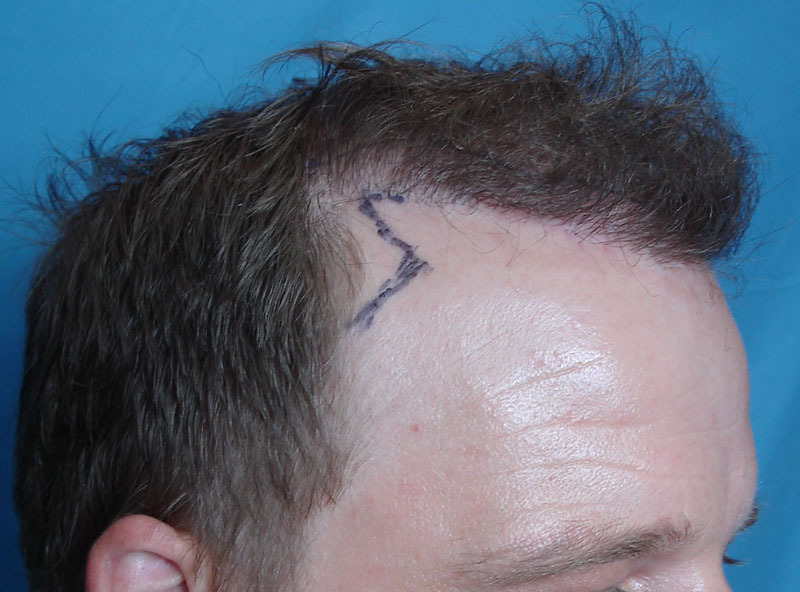 Should the surgery be another strip or another FUE or a combination of both. Hairwar does not have much robust body hair. 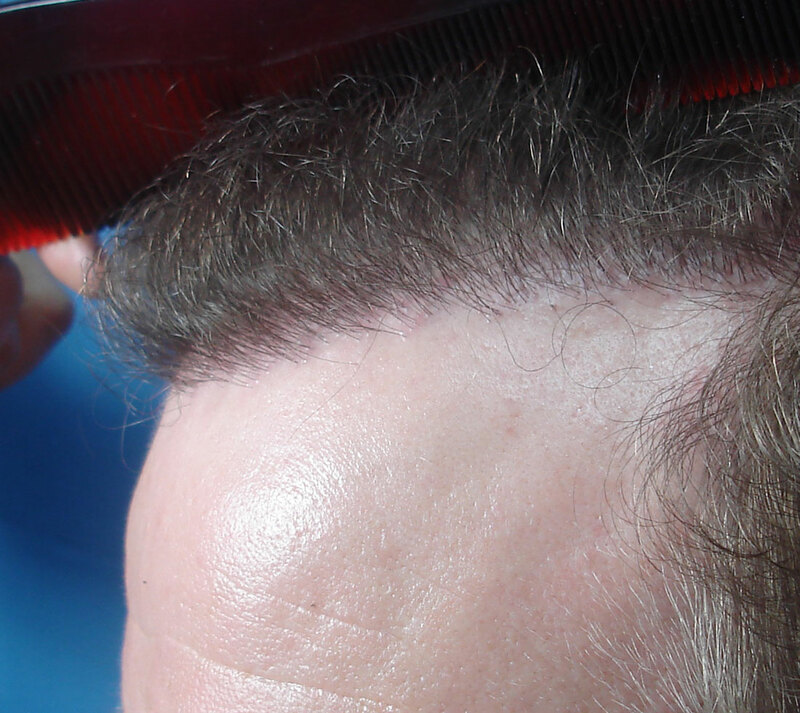 Following are some pictures of the donor area with the hair trimmed down to 4 mm. The picture is taken in flourescent, soft lighting and no flashes. The next picture is taken with using flash + the same flourescent lighting. Hairwar wishes the recipient area to be addressed in the following order of priorities. The top and the hairline area needs to be thickened. The temple points need to be constructed. If any grafts are left, they should be placed in the crown area. Temple point reconstruction will be very helpful to give a more balanced look in hairwar’s case. Due to Hairwar’s previous bad experience with fue, he opted for a strip FUHT. In the strip FUHT, we aimed to excise some strip scars while still managing to get grafts to perform the repair procedure in the recipient area. A total of 3080 grafts were extracted and transplanted. The grafts were used to recreate the temple areas and to fill up the front, the hairline and the top areas. No grafts were transplanted into the crown area. Following are some of the pictures of Hairwar’s recipient area. Some of the pictures on the thread of hairwar are not showing at http://www.hairsite4.com/dc/dcboard.php?az=show_topic&forum=12&topic_id=43115&mode=full . They were uploaded on your server. If possible, please make them available. » They were uploaded on your server. » If possible, please make them available. I found TWO not showing. Am looking into this now. If you know of more than TWO pics that are not showing, please let me know. That scarring was from FUE?? Looks like strip scars. Who was the doc? 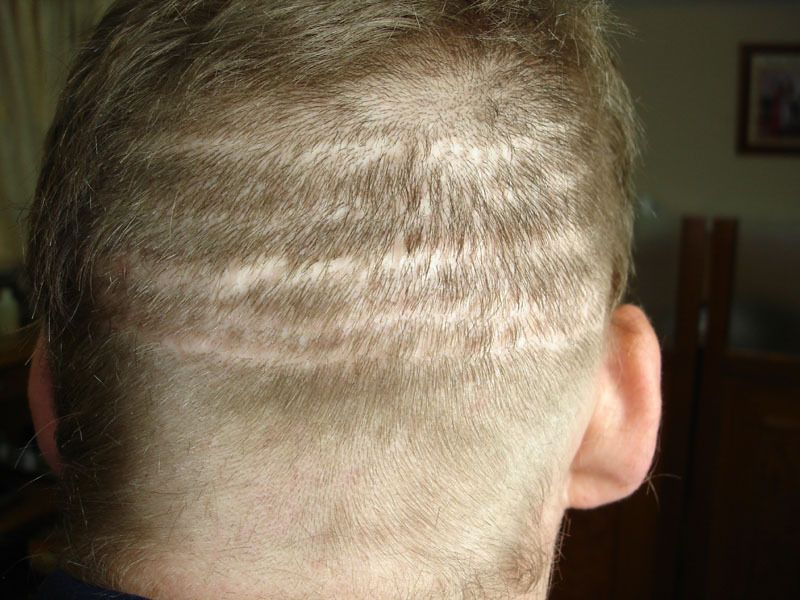 No, those are scars from a form of FUE practiced in the late 80’s/early 90’s in which a “hand engine” was used to remove circular patches of scalp with 20-50 follicular units in each circular patch. This tool looked like an electric drill with a cylindrical blade. The tool was used to make both donor and recipient sites - hence the “plug” look came about. 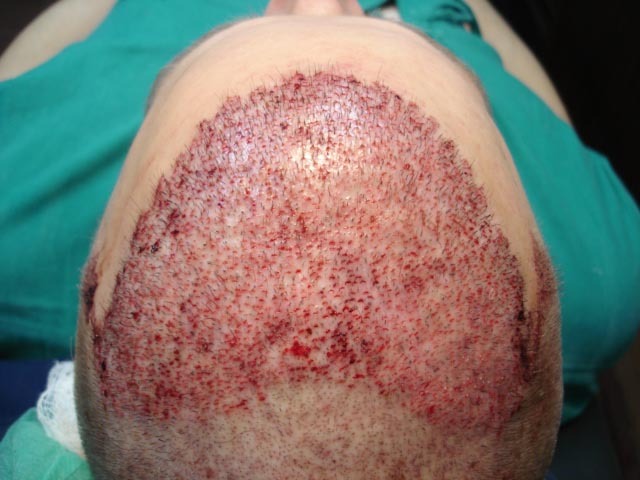 It is only related to FUE in the sense that the donor grafts were small (smaller than a harvested strip) and circular. This was believed to be cutting edge technology at the time. I almost fell for it in my local dermatologist’s office. » That scarring was from FUE?? Looks like strip scars. Who was the doc? 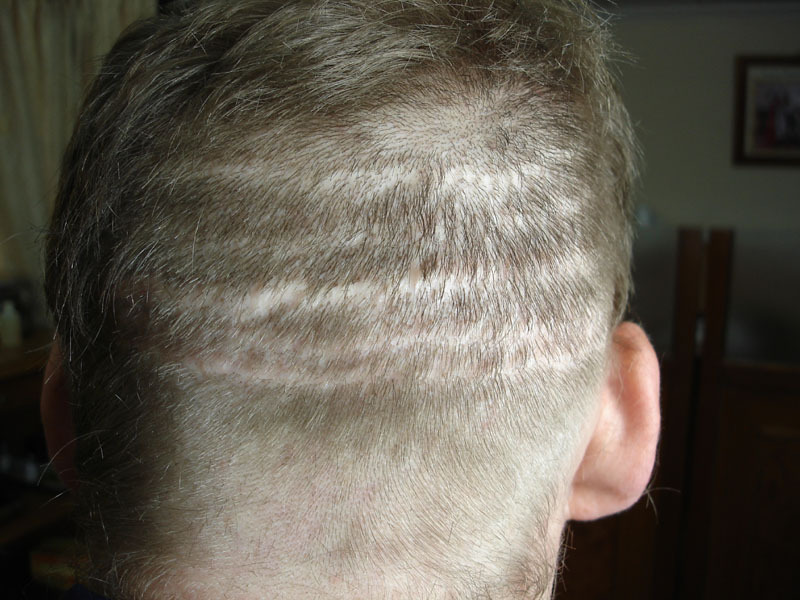 Hairwar had 5 strip scars from 5 previous strip surgeries that had resulted in a pluggy hairline. 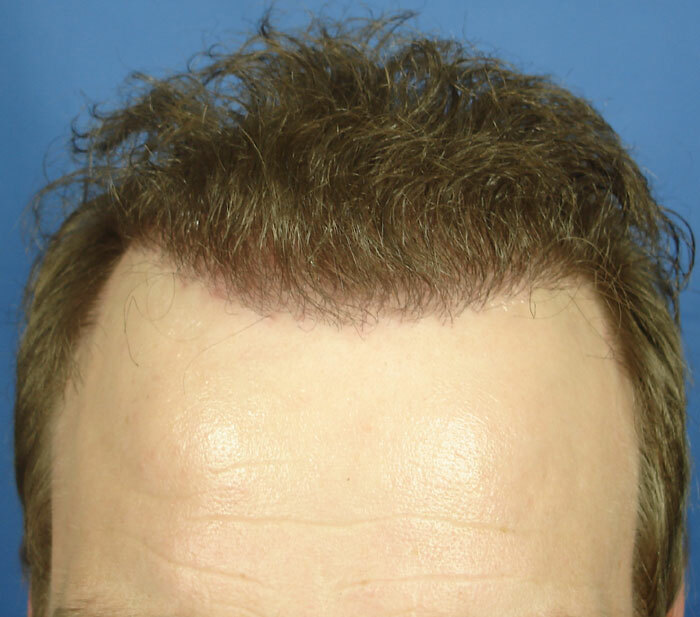 The procedure performed in hairwar’s repair involved excising 2 adjacent strip scars (including the hair bearing scalp in between). 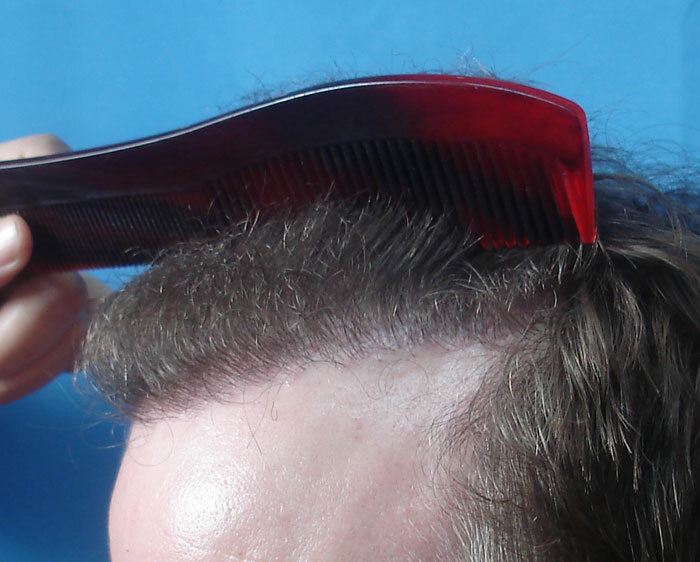 The 3080 grafts, thus obtained, were used to refine the hairline and add density to the frontal third. Now that i look at the pics again, They do look like strip scars. 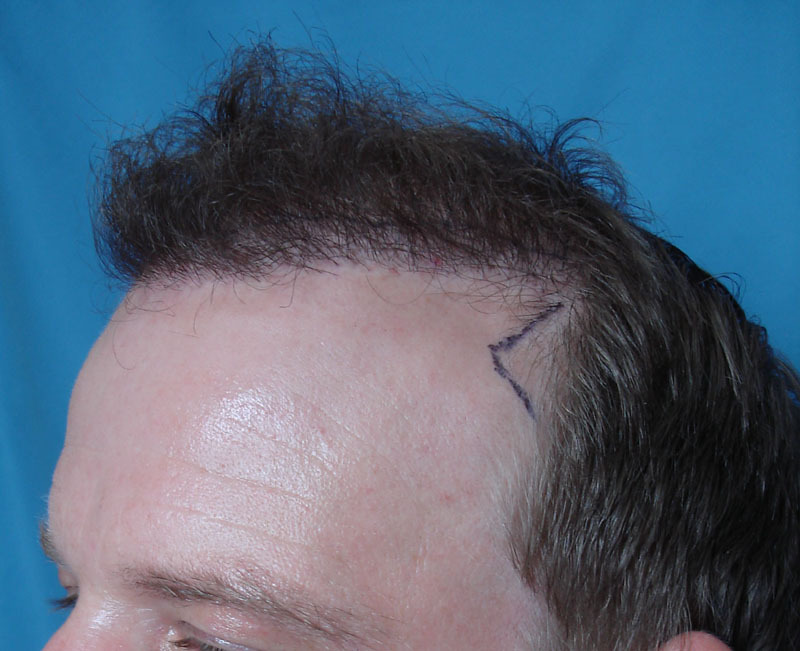 The uppermost scar looks like the typical circular scarring indicative of the the type of procedure I mentioned above because of the apparent gaps in the scar. 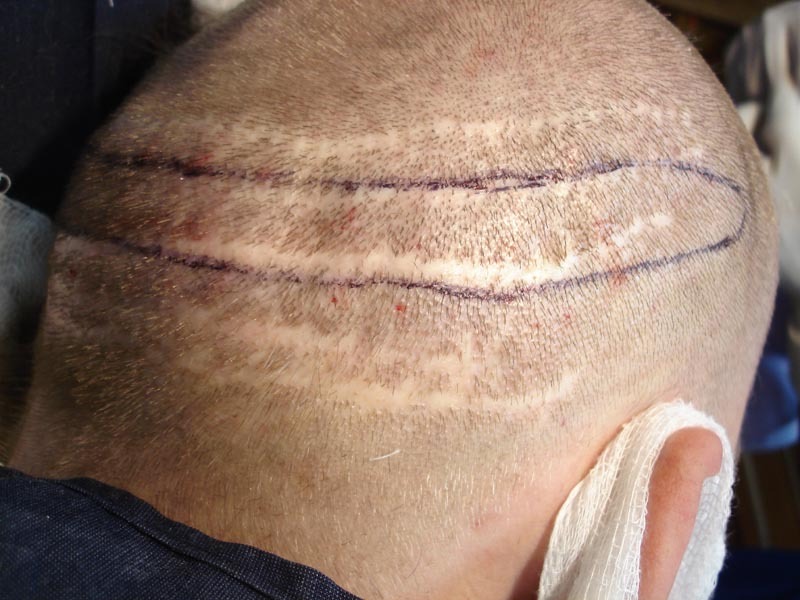 Either way, the previous surgeon was supposed to incorporate the old scars into the new strip, which he obviously did not do. Thanks for sharing Dr A and ‘Hairwar’. (1) Dr A- The after pics are after how many months? (2) Does ‘Hairwar’ also have temporal side pics to share? The following videoclip shows the hair being combed in different directions and parted at various points. To show the density as well as the lack of the former pluggy appearance. » Thanks for sharing Dr A and ‘Hairwar’. » (1) Dr A- The after pics are after how many months? » (2) Does ‘Hairwar’ also have temporal side pics to share? 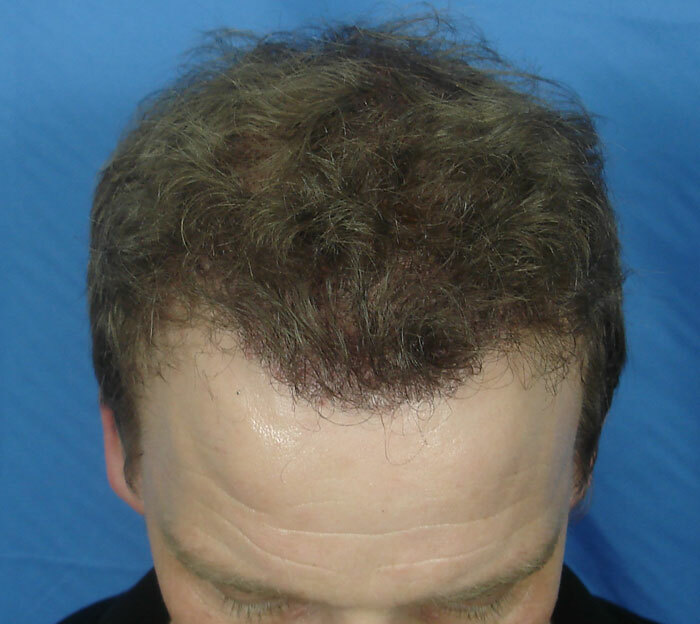 The pictures are 18 months after the repair hair transplant. I will post some profile and top views soon. 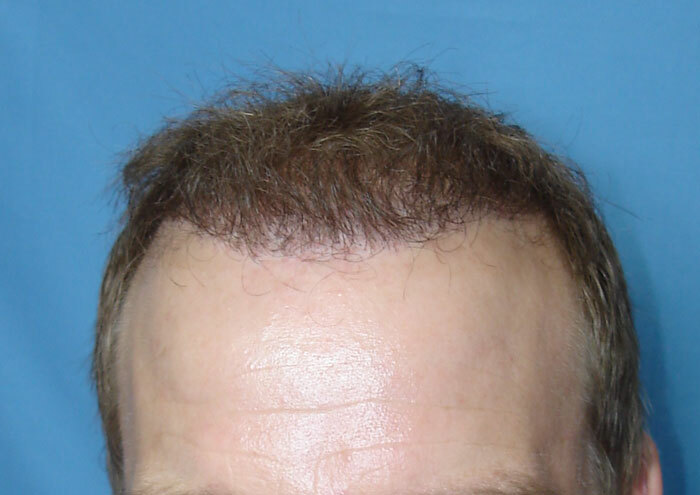 What was the bad experience with fue? This is how a video-documentation should be! » This is how a video-documentation should be! We welcome on all inputs on how to make result documentation as close to “meeting patients in person”. How many strip scars does he have now after this? 4 or 5 ? True, the video- thats one of the best documentations Iv seen in a while. Thanks for sharing and please continue to have such documentation. » Due to Hairwar’s previous bad experience with fue. He hasnt had FUE so why say that he has? » » Due to Hairwar’s previous bad experience with fue. » He hasnt had FUE so why say that he has? 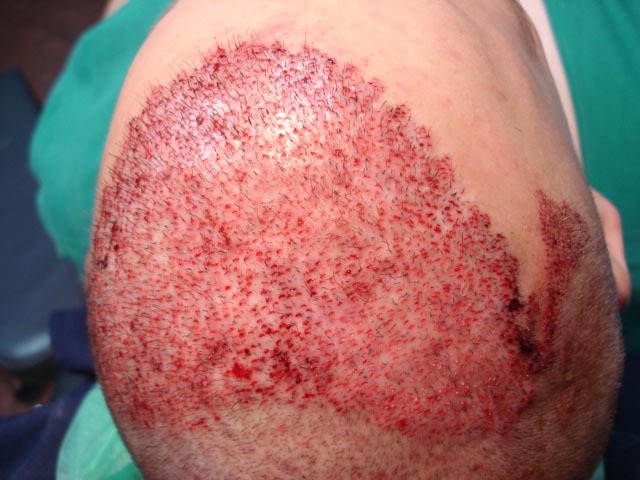 He had a fue in Turkey before visiting our clinic. How many grafts did he have from the Turkey clinic?